In terms of long-term survival, we can’t talk enough about having and maintaining a clean water supply. One excellent source of clean drinking water that is reliable and very safe for consumption with little or no purification required is rainwater. When water evaporates it leaves behind any contaminants, minerals, microorganisms or infectious materials and becomes an individual water molecule. When water vapors cool, they condense and form clouds. If conditions are correct and enough water vapor has condensed the water vapor will condense further and fall to the ground as rain. This rainwater can be collected and stored in a cistern and used for household activities and survival. Some instances of rainwater pollution are to be noted (heavy water and acid rain come to mind) but the likelihood of exposure to those kinds of contaminations will be fairly limited in a post industrial/apocalypse environment. First things first, you’ll want to read up on how to install an effective cistern. We recommend “Water Storage: Tanks, Cisterns, Aquifers, and Ponds for Domestic Supply, Fire and Emergency Use–Includes How to Make Ferrocement Water Tanks” by Art Ludwig. This book is going to give the rundown on everything you’ll need to know to effectively and safely install and implement a cistern into your survival plan. 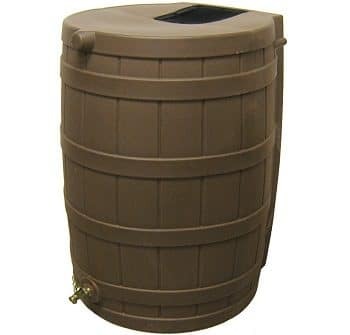 Once you’ve decided which plan you’re going to implement, you may decide to go with a traditional rainwater collection barrel system. If you go that route, check out the Good Ideas RW50 Rainwizard collection barrel. These barrels have a filtered opening that helps to keep debris out of your collection barrel and port to attach your downspout system to. The Rainwizard barrels have 50-gallons of capacity, so having a few of these on hand should allow you the ability to stockpile copious amounts of water. Remember, water is life and you’ll need to keep getting it as long as you plan on living. So make a plan and stay alive.